Historical analysis is useful for understanding the broader (and sometimes the not so broad) patterns of human societies.Some patterns are universal enough that they can be applied to almost any human society and can be expected to happen when certain conditions are met. Overshoot and empires are a good example, most civilized societies (as in the presence of urban centers) have had empires or empire like behavior and even hunter-gatherer tribes have gone through overshoot at one point or another (see the die off of large animals outside of Africa), the first trend is restricted to certain civilization types while the latter is endemic to all. Then there are ones that are more specific and are more restricted, such as anacyclosis or most tribes being in near continuous war. Anacyclosis is specific to societies with a democratic tradition and for state societies war is more often the exception than the rule whereas for tribal societies it is the opposite. And then there are the patterns which are restricted by geography and/or climate, the simplest example is the divide between East and West in Eurasia. Ever since Darius invaded Greece (and most likely earlier) that line has been set in stone and it shows no sign of moving, it is almost entirely a product of geography. There are also hybrid patterns, that are a mixture of geography/climate and societal type, a typical one is the relationship with the coast which depends on shipbuilding abilities and land based transport as much as the coast itself. The purely geographic and societal approaches can easily be used to analyze the possible future of Australia, but a combination cannot be used easily. Yes, the Aborigines have been in Australia for 50,000 years and managed the landscape for their own use, but they never founded cities, had the wide range of crops and animals we now have and had a very low social complexity. Different societies interact with their geography and climate differently, mainly it depends on their subsistence methods, and so how current Australian society interacts with it's geography over the scale of centuries to millennium is mostly unknown. We can guess some of it from similar situations elsewhere, such as how the coastal nature and shipbuilding interacts, but otherwise its unknown. The main lessons can be seen from how Australia has been populated in the past and how colonization went. To the left is a map of Australia's population distribution. That pattern on the map to the right is likely to stay roughly the same for the foreseeable future (though likely with a more even distribution due to a movement of the population away from the capital cities and into rural areas) due to geography. The gap between WA and South Australia for example is due to it being a desert (think the Nullarbor plain), not because of an arbitrary decision. The reason for most of the country being white (or effectively uninhabited) is that it is simply uninhabitable for even slightly significant population densities, calling it a wasteland is fairly accurate. Its the sort of environment that only hunter-gatherers can use while being self-sufficient. The parts that show up on the map are the places that are nice, fertile and habitable by city based societies. It isn't an accident that the population is based around the south-east coast, those parts happen to be the nice fertile areas. Same with the north coast being lightly population (you can just barely see Darwin on the map), it is entirely due to the enviroment and there isn't anything that could really change that and make the north coast populous in any relevant time scale (it could see a population rise due to increased cross strait trade but nothing significant). Same with almost the entire west coast, most of Australia can't support agricultural societies and horticulture societies are likely to do only marginally better (and only in parts of the north coast). 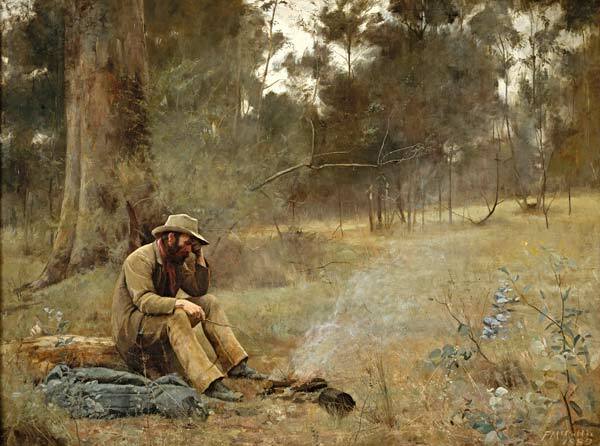 The idea of running to a remote part of the country and homesteading may make sense in America, but here in Australia it runs into the fact that most of the landscape is hostile to anything but hunter-gatherers and the parts that aren't hostile are generally not remote and already settled. While their are some areas where this is possible and it has been done, it would quickly run into problems if it ever became even remotely popular. The idea of copying the swag-men and becoming mobile is a far better idea and has worked before in Australia's history. Nomadic herders and other non-agricultural societies that aren't hunter-gatherers may well work in the future there, but as they haven't existed yet, we can for the moment assume they won't. Elements of those societies have existed, see the stock men of the outback, but not as a fully separate cultures. This suggests that some form of such a society will exist but it could be deeply connected to the more populous city based societies by necessity, this connection however is necessary for those societies to be significantly more technologically capable than the stone age. The two Colonizations of Australia show a similar pattern and can also help show future patterns. The first successful colonization was by the Aborigines and they mostly succeeded by being hunter-gatherers and slowly diffusing throughout the country. After that quite a few other people visited Australia, the Indonesians used to visit the north coast regularly for certain goods. There were Chinese visits as well, yet they didn't choose to colonize Australia and probably couldn't have if they tried. Later on quite few European powers visited Australia or were at least aware of its presences, the Dutch, Portuguese, Spanish and French. Yet, only the English attempted colonization and more as a convict dumping ground than for an actual colony. That again is more a product of geography and climate, the north coast is mostly uninhabitable and therefor not a candidate for colonization, so it most of the west coast. And it's not an accident that botany bay was chosen first, even through it would be quicker to get to Perth from England. And although the habitable Margret river area was theoretically easy to get to from Europe due to the clipper route, it wasn't considered a candidate by the other powers, though this was also partly due to the lack of good maps of the area. The parts of Australia that are readily accessible from the outside world aren't the parts that are habitable by city based societies. Maps have changed that somewhat by showing the best ways to get around, but the underlying geographical reasons have not. The main underlying reason is the sheer distance the habitable parts are from anywhere else that's habitable. I'll put it into perspective, the distance from LA to New York is a rough approximation of the width of the USA and on mapcrow its given as 3932.8Km. On mapcrow the distance from Jakarta to Perth, good rough approximations of the distance to travel from Indonesia to to a habitable place on the west coast, is 5592.47Km. Interestingly its about the same distance as New York to London. Its important to note that their isn't any habitable stopping point until you get to Perth, and the winds are pushing you into the country, while with a migration across the continental USA you can stop and even settle in most of it. Similar distances exist to getting anywhere else and only New Zealand (because of the clipper routes effect) can be considered close to the habitable parts in any conventional sense. While there will be some trade with Asia, its likely to be overshadowed by the south American and southern African trade due to the clipper route. When using the clipper route, after Africa everyone used to move north so they could get to Asia. If you didn't, then you ended up smashing in the west coast of Australia, so until its extent was found it was almost impossible to reach the southern part. Since the future of maritime travel is likely to be sailing, the clipper route and other wind patterns will be of prime importance for international trade and links to other continents. An important part of that is that distance isn't the most important factor, only the ability to travel. So having more connections with South Africa and South America than Asia is actually more likely given Australia's settlement patterns and the prevalent winds (the roaring forties and furious fifties are strong and steady winds). This is also likely to mean that Perth will be a major international port. And the climate change we can expect doesn't change those sort of wind patterns enough as far as I'm aware. So the main lessons of Australia's history is that it's hard to get to the habitable parts and most explorers/settlers have decided its not worth it, especially the ones who looked at the north coast. Most of it is inhospitable for agricultural societies and settlement patterns are mostly coastal along the south and east. The links are most likely to be along the southern hemisphere to take advantage of the clipper route, since sailing will be the dominant maritime transport technology. Other than that, there aren't many lessons from Australia's history that come from it's geography and climate. On the social side, Australia is the most peaceful of the continents in which people live, the Eureka stockade was the closest thing to a revolution that's happened and there have been no invasions. What forces that have caused this (other than an extreme distance from everywhere else) and how they'll interact with overshoot is unknown, though it is possible to speculate its something that I don't know enough about to attempt. Though it would be nice to keep Australia's track record of 0 major political explosions (as in full scale revolutions) and to only have disturbances of the Rum rebellion level. 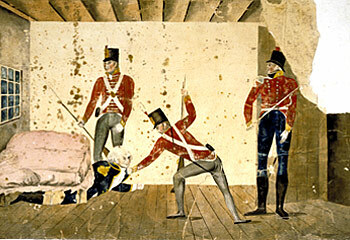 The Rum rebellion was led by John MacArthur to defend his sheep-farming interest, not some principle like justice, freedom or equality as is the tradition.